'Classy Lady' (Anton Mego, R. 2013). Seedling# AM-05/1942-2. TB, 35.5 (90 cm). Late midseason bloom. 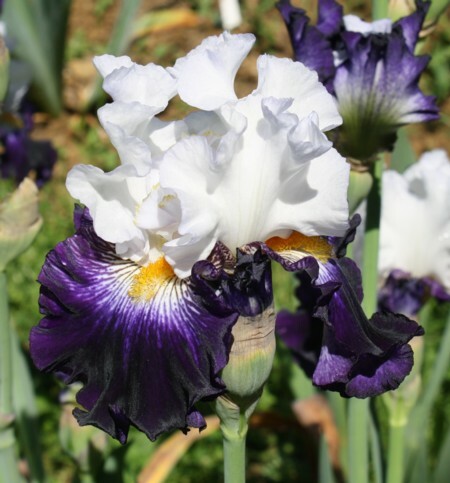 Standards clear snow white; style arms white, light cream-yellow crest; falls dark velvety blue-violet, white area around beards full of blue-violet veins, brown hafts; beards yellow-orange; slight sweet fragrance; wavy. Seedling# AM-02/0990-1: (seedling# AM-99/0379-2: 'Ujlak' x 'Acoma') x 'World Premier') X 'Starring'.